Via TFCLUB变形金刚联盟 Weibo we have our first look at the new Transformers x Ghostbusters MP-10 Optimus Prime for your viewing pleasure! We finally got images of this new MP-10 Optimus Prime repaint, first rumored via a mysterious listing with no images in a Malaysian website. This figure comes as as part of the Transformers x Ghostbuster collaboration which included the new IDW Transformers x Ghosbuters crossover and an Ectotron figure. The figure is our good-old MP-10 mold with a white torso with some red details including the Autobot and Ghostbusters insignia on each shoulder and green windows. The head and legs are dark gray/blue and Roller is dark gray with a white hood and the Ghostbusters logo on it. And of course, Slimer is included!. The alt mode is mostly white with the trailer decorated with a red stripe and a Ghostbusters logo, and to top it all green slime splashes over it. The trailer also features the phrases “Call us 555-2568” and “We’re ready to believe you” on the side, and we hope you got that reference. We also have a look at the packaging, showcasing the figure in truck mode and labeled as “MP-10B Optimus Prime Ecto 35 Edition”. Rumors point that this figure will be officially revealed at the next San Diego Comic-Con, but you can now click on the bar to see the images attached to this news post and then sound off on the 2005 Boards! 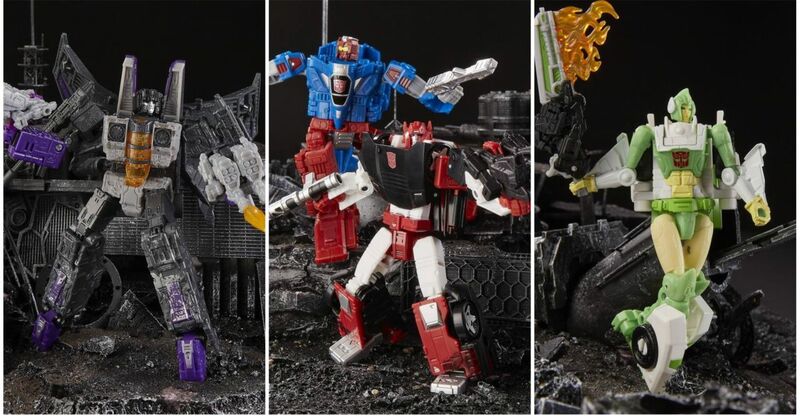 New Siege Figures Revealed – G2 Sideswipe, Slamdance, Skywarp and More! No word on when or where these will release, stay tuned for official word! Yesssssssssssssss. 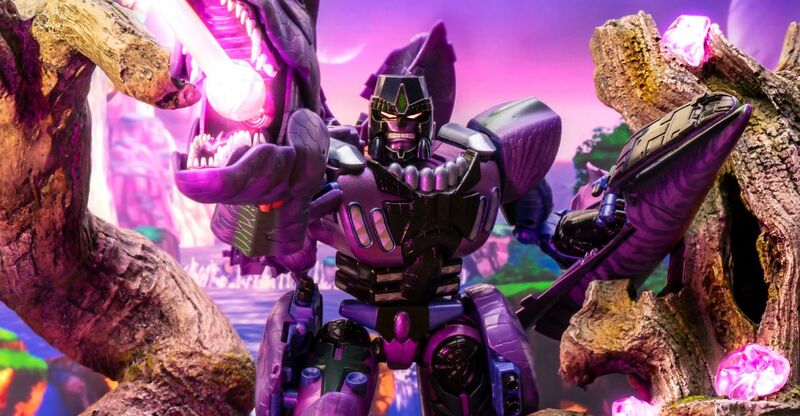 Masterpiece Beast Wars Megatron is in the building! MP-43 is a beast of a fig (some pun intended), giving the leader of the Predacons a worthy representation on any Beast Wars fan’s shelves. Standing taller than both MP-10 and MP-36, he’s a big bot. Transformation is similar to the original, with lots of added flips and tucks of course, resulting in very show accurate looks in both modes. HQ paint is present, giving the entire beast mode a 3D look to homage the show, while the robot mode gets metallic sheen everywhere. Accessories are solid with a show accurate rifle, toothbrush for his dino teeth, 2 extra faces and clips so he can use Dinobot’s display stand. He also features light up eyes and sounds (Japanese). In the show he was much larger than Optimus Primal, and the scale shows here, as he towers over the Maximal leader. There are reports of fragile torso and crotches leading to some breakage, but I did not have any issues myself. The torso was SUPER tight out of the box though. Bottom line, this is a superb piece, high quality head to toe, fun, and accurate to the source. If you are a Beast Wars fan, and have the funds, he is definitely worth a pick up. Click the gallery link below to see over 100 HD images of MP-43 Megatron. We’ve also attached a couple to this story after the break! ICYMI – Check our previous MP Beast Wars galleries here: Optimus Primal, Cheetor, Optimus Primal (Legendary Ver), Dinobot, Shadow Panther. He’s in stock and shipping now at TFSource! 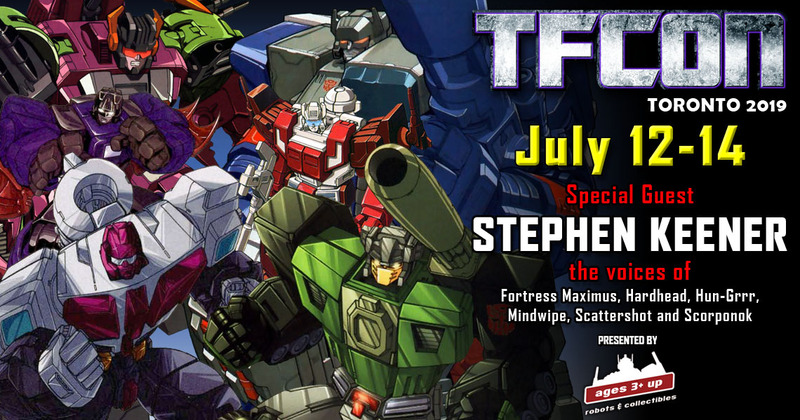 More WFC Siege! I wasn’t joking when I said I was actually grabbing off the shelf main line figures this year 🙂 Today we are sharing the gallery for Deluxe Sixgun, a recently released Deluxe wave 2 figure. He comes packed along with Ironhide, Chromia and Prowl. I was looking forward to Mr. Sixer specifically though because I was/am a big fan of Generations Metroplex, he’s been a centerpiece on the top shelves for a while and always thought he deserved his crew. Now we have Sixgun and Scamper, so come on Hasbro, give us that Slammer. 🙂 Sixgun has a traditonal robot mode with lots of inspiration from the original, breaking down into more than six guns this time, lots of weapon based parts can be reconfigured and attached to other Transformers. He also has a vehicle mode this go round too. Really great upgrade that homages the original gimmick. On top of Sixgun which is more fresh, we also added base shots for Voyager Optimus Prime and Deluxe wave 1 Hound. I’ve had these here for a bit and decided to at least run some basic shots since I was in a full Siege shooting session. Hit the links below to check out over 100 HD images after the break courtesy of TFSource! You can also check a select few shots after the break. They’re in stock and shipping now! 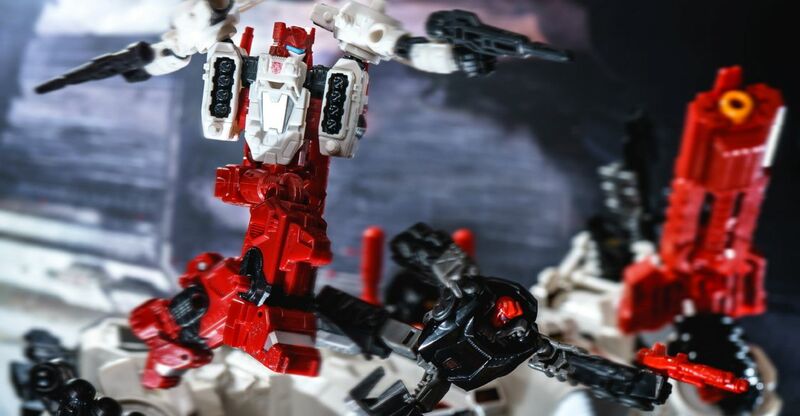 Time for another round of War for Cybertron Siege galleries! 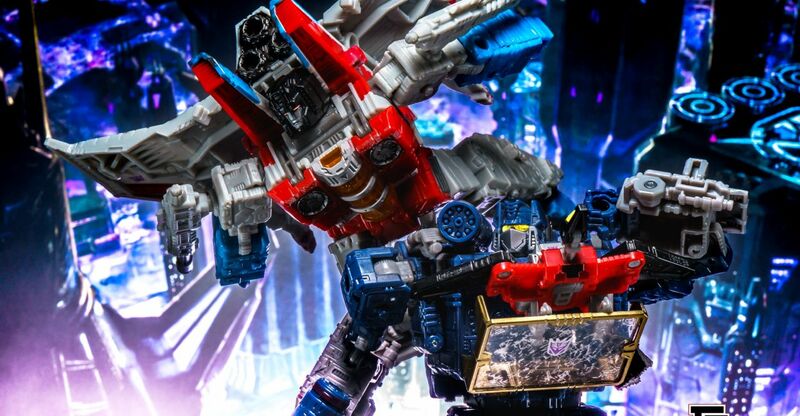 Today we are looking at the recently dropped Voyager Wave 2 set – Starscream and Soundwave. We couldn’t do Soundwave without his buddies though so we are also tossing in some shots of the Micromaster Spy Team Ravage and Laserbeak two pack! All of these are dripping with G1 flavor while switching it up a bit for their alt modes. Starscream is a Cybetronian TetraJet and Soundwave is a space cruiser of sorts, with unofficial street lamp mode! He can also kinda maybe turn into a cassette player if you really try and squint. In robot mode, they look like modern versions of the characters we know and love, with shape, color, scale and key features present everywhere it counts. When these are coupled up with Shockwave and Megatron, that 84 line up is looking pretty sweet. 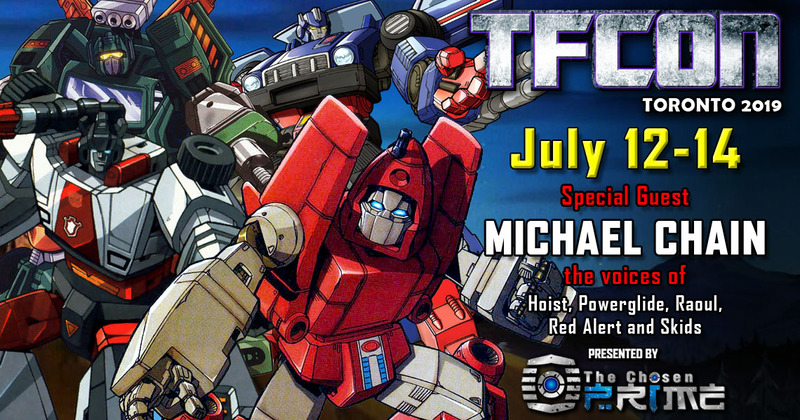 We’ve run them through a session, hit the links below to check out over 100 HD images after the break courtesy of TFSource! You can also check a select few shots after the break. 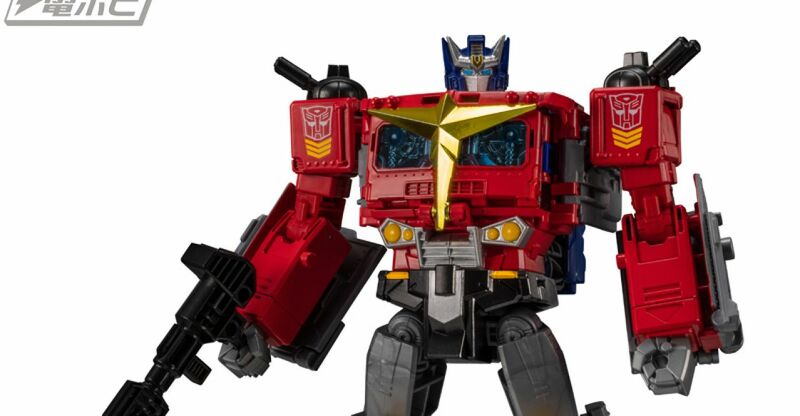 Courtesy of Hobby Dengeki Web we have our first official color images of the new Takara Tomy Transformers Generations Select Star Convoy. Shown first at Wonfer Festival 2019 (gray prototype), Star Convoy is an extensive remold of the Power Of The Prime Leader Class Evolution Optimus Prime. 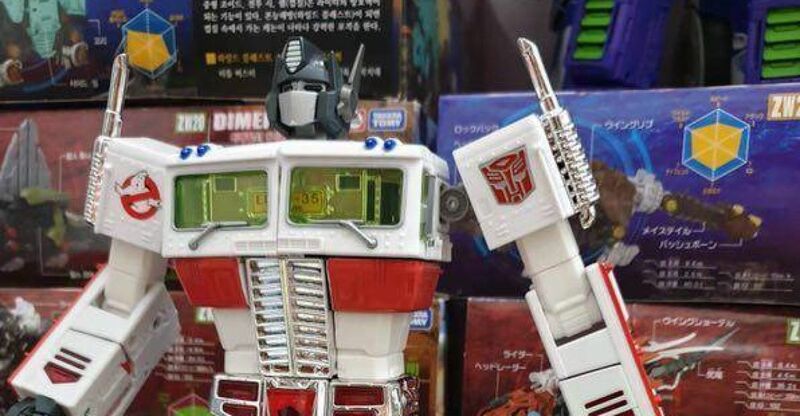 As seen in the LG-EX Big Powered online manga, the mold is now an inner G1 Optimus Prime figure that combines with his trailer to become Star Convoy (from the Japanese Battlestars TV-Magazine). Star Convoy is revealed as the first release on a new Takara Tomy line: Generations Select which will be sold exclusively via Takara Tomy Mall Website. This line will bring characters that are not present in the regular Generations line. To make things even more interesting 2 teaser silhouettes for upcoming characters are shown. One seems to be a Power Of The Prime Voyager Galvatron remolded as Megatron (or Super Megatron? ), and the second one seems to be… Seacon Snaptrap? (or Turtler as he was known in Japan). Seacons in the horizon? It’s time to speculate and place your bets! Star Convoy is priced 8,500 Yen (excluding tax) or $76.21 and scheduled for release in late September 2019. Click on the bar to see the mirrored images and teaser silhouettes for this new Takara Tomy Mall exclusive line. After that, sound off on the 2005 Boards! 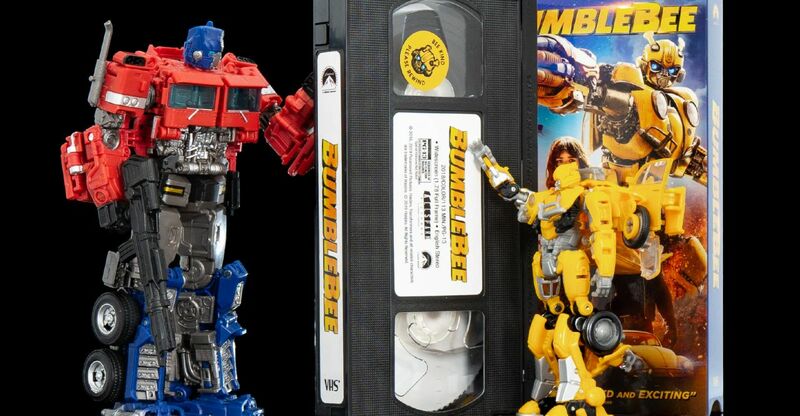 Paramount and TFW2005 are teaming up to give away a Bumblebee Movie themed prize pack to celebrate the movie hitting physical formats today! 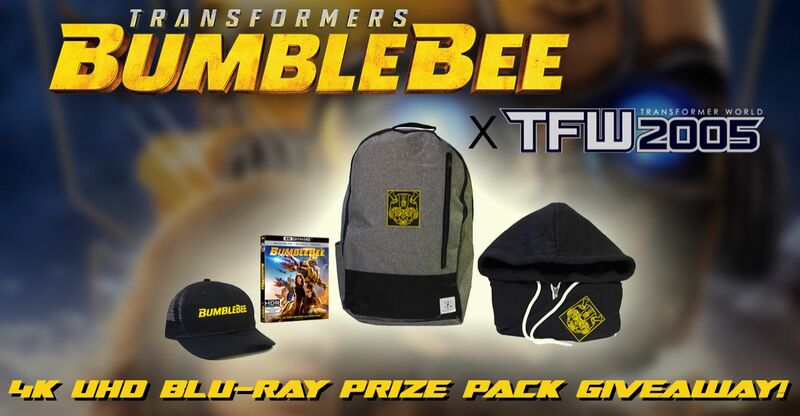 Included in the pack is a Bumblebee hat, bag, hoodie and a copy of the Bumblebee movie on 4k UHD Blu-Ray (with regular Blu-Ray and Digital included). All you have to do is enter using the form below and you’ll have a chance to win! If you want to increase your chances, you can perform the extra steps each day. The contest will close on Sunday April 7th and we will announce the randomly chosen winner on Monday. Good luck! If you can’t wait, Transformers Bumblebee is out on Blu-Ray and DVD now, in stores everywhere, grab your copy today!